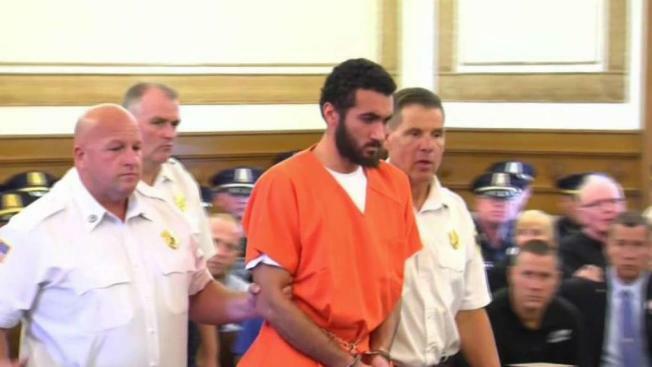 Suspect Faces Court in Killing of Weymouth Police Sgt. The widow of Weymouth Police Sgt. Michael Chesna lashed out at the man accused of killing her husband in court Thursday. The widow of a police officer who was shot and killed in the line of duty screamed profanities at her husband's accused killer as he was led out of court following his arraignment Thursday. Emanuel Lopes, 20, was ordered held without bail after pleading not guilty to multiple charges in the July shooting deaths of Weymouth Sgt. Michael Chesna and 77-year-old Vera Adams during a hearing in Norfolk Superior Court. Chesna's wife, Cindy, was seated in the back of the courtroom and could be heard sobbing loudly throughout the proceeding. As Lopes was led out of court, she began screaming profanities at him. "You're a piece of (expletive)!" she shouted, before breaking into tears. "He's a monster," she added after Lopes had left the courtroom. The courtroom was filled with members of the Weymouth Police Department and other members of Michael Chesna's family for Thursday's hearing. Lopes hung his head and stared at the floor throughout, speaking only to enter his not guilty plea. Lopes was indicted two weeks ago on 11 charges stemming from the slayings of Chesna and Adams. The charges included two counts of armed assault with intent to murder involving a firearm; one count of assault and battery with a dangerous weapon, a rock; one count of larceny of a firearm; one count of carrying a firearm without an FID card; one count of use of a motor vehicle without authority; one count of negligent operation of a motor vehicle; one count of leaving the scene of a collision causing property damage; and one count of malicious destruction of property. On July 15, Chesna responded to a call of a crashed vehicle when he saw Lopes allegedly vandalizing a house in the area of Torrey Road and Burton Terrace. "The defendant walked briskly with the rock over his head," said Assistant Norfolk District Attorney Greg Connor, "and threw it double overhand style, hitting Sgt. Chesna in the face and head." Lopes then allegedly shot him eight times with his own gun. Lopes then allegedly fatally shot Adams, who was standing near a window inside her home. Lopes' attorney argued Thursday that his client should be released on bail, with the condition that he be confined in a mental health institution while the case is pending. "This is a 21-year-old man who has suffered from mental illness since he was young," attorney Larry Tipton said. "His mental health history is well documented." He said Lopes' mother had unsuccessfully tried to have Lopes involuntarily hospitalized shortly before the shootings due to his erratic behavior. "I'm heartbroken for everyone ... I attempted to have him sanctioned," Lopes' mother told NBC10 Boston in a series of text messages. "I told him them he was a danger to himself and others ... I told them he was very unstable." But, Tipton said, the hospital declined. The attorney added that Lopes' cell phone showed that he had videotaped himself "talking nonsense," and in the days leading up to the shooting he was telling people that "martians had landed." Lopes is due back in court Nov. 30 for a pre-trial conference.